Store passwords & serial numbers. Is there a better alternative to RadicalSafe? Is RadicalSafe really the best app in Personal Info Managers category? 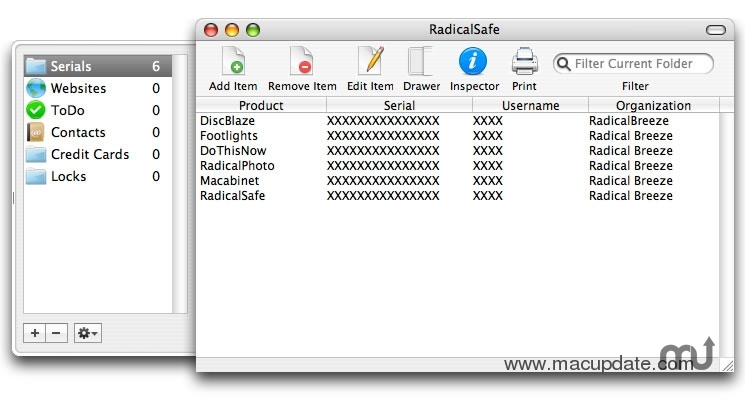 Will RadicalSafe work good on macOS 10.13.4? RadicalSafe is an application designed to allow users to store various kinds of information, such as serial numbers and passwords. Create folders with specific categories, or use the default folders. View each item in a global inspector so you can quickly exchange data with other applications, and click an item to instantly copy it to the clipboard. Optional password protection and Blowfish encryption help keep your data secure. Lock RadicalSafe while you walk away for a minute. Use a password generator to create original passwords quickly. Columns can be covered from the main window. The application can be locked from the main window. The password generator can be accessed from the main window. When entering an incorrect database password, the focus is properly set to the password field. Folder icon no longer distorted. RadicalSafe needs a rating. Be the first to rate this app and get the discussion started!